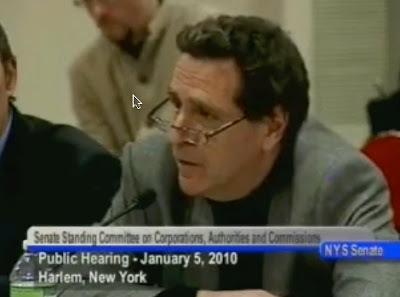 Thanks to the full video from the January 5 state Senate oversight hearing on eminent domain, it's worth a look at the Empire State Development Corporation's (ESDC) historical explanation for its blight studies, and civil rights attorney Norman Siegel's forceful comment, in which he suggested that the spirit of Martin Luther King, Jr.--whose 1968 assassination spurred the establishment of the agency--had been perverted. During the hearing, state Senator Bill Perkins tried to drill down to the ESDCs standards regarding blight after AKRF delivers the "study of neighborhood conditions". "Let me ask you, what is your standard that you use, to determine blight," he asked ESDC General Counsel Anita Laremont. "Do you have like a sheet, or some other kind of measures that you use that, when you get facts, you look at them in terms of those measures and you say, OK, bingo, it has measured up to the definition of blight?" "No," responded Laremont. "We use the standard that's set forth in the UDC [Urban Development Corporation] Act, which is that an area be determined to be substandard and insanitary. And we have always maintained, in litigation, that it is not a static kind of measurement that can be reduced to specific criteria on a sheet of paper, because it has to do with a number of different factors in various environments." "I don't understand what you're saying," Perkins murmured, then raised his voice: "What I'm trying to get it is ways that you can assure the public, which is in great doubt right now, that your decisions are on the merits." "Are you asking if there's a checklist?" asked ESDC VP Darren Bloch. Perkins remained quizzical: "So who as a part of the team that looks at the facts of the study and says OK... and they all sort of agree. Is it one individual that reviews the study and makes the determination? Is it a team?" "When the study is completed, the blight study itself goes into the package of materials that go to our board of directors," Laremont said. "And that is part of the analysis that the directors use to make their determination of whether or not a project is blighted." "The blight studies evolved over time based on our view that it was appropriate and proper to document empirically a condition of a neighborhood," she said. "That that was much better than simply making a conclusory statement in board materials that we have found an area to be blighted. And so we view these studies as a way of having documentation regarding a neighborhood and an area such that we give our board better information on which to make the determination." "Let me end on a personal note," Siegel said, with emotion. "Sitting here on 125th Street, walking around this building, seeing some of the names and the icons from this community, listening to the people from ESDC speak. On April 4, 1968, when Martin King was assassinated, our governor, Nelson Rockefeller, in the memory and to continue the legacy of Martin, he created the Urban Development Corporation, which is now the Empire State Development Corporation. "There were great hopes, and great dreams, and visions of what UDC was supposed to be. I remember that. As a young kid in Brooklyn, who went south in the civil rights movement, and met with Dr. King, worked with SCLC many times--today, this agency, in the name of Martin Luther King and Nelson Rockefeller, is doing exactly the opposite of what the UDC was supposed to be set up for. The UDC was supposed to be set up in the memory of Dr. King in order to clear quote slum areas and create affordable housing for poor people and people of color." "And so I commend you for your walking alone," Siegel concluded. "It's not easy to do what you do. Especially when the elected officials, from the great Charlie Rangel, to the Borough President, Scott Stringer, to the local City Councilman, Bob Jackson, go the other way. you've always gone the right way, and the left way, and, in the context of that, we applaud you. And we're here today not only to talk about these issues, we're here in tribute to you, to give you the courage and support to continue this fight, because, when all is said and done, this is a civil rights issue of the twenty-first century."